I don't know about your house, but our life can be overcome by paper. From the kids school work to financial documents, there seems to be in influx of papers coming in the door. While we try to do our best and get some items electronically, I don't think that all the paper will ever go away. This situation begs the question, what do you do with all that paper? One option is to have piles sitting on your desk, counter or table. This option can make your house look disheveled or you can misplace an important item. A better option would be to toss unimportant papers and file away important ones. So what type of filing system could keep you organized? Personally, I like the binder system. Why do I like the binder system? There are several reasons. First, I can easily collate a group of information in a single location. Second, binders can be color coded for specific types of information. Lastly, a binder is portable for meetings or other events. Having used the binder system for a while, I have found some brands work better. The Staples Better Binder with removable FileRings is my favorite.This one inch binder is sturdy and hold up to 275 sheets. I can keep all my documents in a single location without the fear of misplacing anything. Most importantly the Staples Better Binder has a removable ring; the only binder that offers this option. The removable ring means that you can detach the ring from the binder and file your whole system into your filing cabinet. No need to take out the papers. Simple click and be done. The removable ring fits in most filing cabinets and boxes. 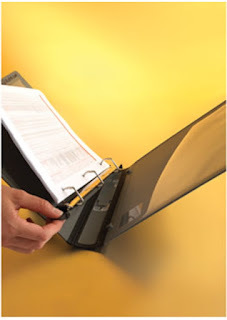 The binder itself can be used year after year with replacement rings. Not having to replace binders every year means that my color coding system can stay in tact. The Staples Better Binder retails at Staples for $12.99 each. Additional ring refills are $4.99. Are you ready to get all your papers organized? Staples has graciously given me 3 Staples Better Binders and 3 ring refills to giveaway. Please use the Rafflecopter to enter. Disclosure: I received this product to review and to giveaway. All opinions are my own. I LOVE to just go look at Staples... They have so many wonderful things! I like the idea that this is able to be put into the filing cabinet. Staples has so many products that keep you organized! I love the binders you mentioned above. I'd love to own the Staples® The Desk Apprentice™ Rotating Desk Organizer. A great shredder to help me safely dispose of unnecessary papers.